Now, here’s another one (see “Paging Dr. MacGyver” below) of those ‘gee whiz’ things that slightly boggles the mind even as it leaves us wondering where new technologies will take us next. You see, it seems that every time our hearts beat, the increase of blood volume under our skin results in our complexion darkening at an imperceptible rate. Well, imperceptible to the human eye, anyway, and that’s where the gee whiz kicks in. As it turns out, not only can that difference be spotted by a sensitive camera, it can even be spotted by the basic front-facing camera in your average iPhone or iPod Touch, and some enterprising folks at the MIT Media Lab decided to create an app to do just that. 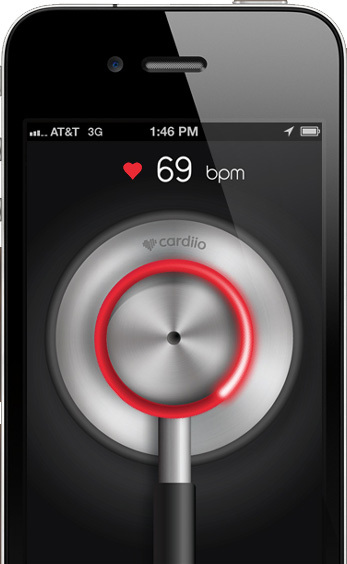 Available for free (at time of writing, though there are charges for extra features), Cardiio simply asks the user to stare at the center of the stethoscope and hold still for a few seconds while if fixates on your flashing face. The result pops up as soon as it’s done, and the measurement can be saved in case you want an ongoing record of your heart rate. There are also little tidbits like comparisons of your heart rate to other examples (apparently my resting heart rate is 19 percent lower than the average Tanzianian, and 2 beats higher than Rafael Nadal), a guided 7-minute workout, and prediction of your life expectancy (though you’ll have to pay for that last one, and let’s face it, there’s more to that question than your resting heart rate). Does all this technology set your heart to racing? Download Cardiio and find out.